Improve access to psychological therapies: In our most recent practitioner survey, access to psychological therapies was identified as the biggest barrier to delivering effective primary mental health care in Wales. Although the Mental Health (Wales) Measure 2010 has started to improve access, we know that waiting times for one-to-one psychological therapies are still too long for too many people. We urge the next Welsh Government to build on its work over the past few years and do more to reduce these waiting times in the future. Improve support for GPs & primary care practitioners: Our survey also indicated that mental health is becoming an increasing part of the primary care workload and that GPs and other primary care practitioners would like more support to deliver high quality care. The survey also identified that primary care workforce is feeling under pressure and would benefit from more support to look after their own mental health and wellbeing. 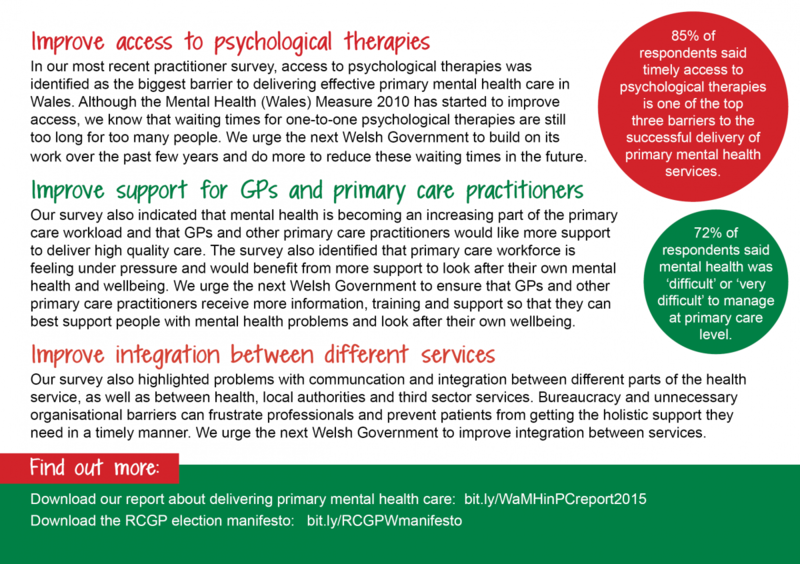 We urge the next Welsh Government to ensure that GPs and other primary care practitioners receive more information, training and support so that they can best support people with mental health problems and look after their own wellbeing. Improve integration between different services: Our survey also highlighted problems with communication and integration between different parts of the health service, as well as between health, local authorities and third sector services. Bureaucracy and unnecessary organisational barriers can frustrate professionals and prevent patients from getting the holistic support they need in a timely manner. We urge the next Welsh Government to improve integration between services. Contact you local Assembly candidates and ask them to pledge their support for our three priority areas. You can do this on social media, by email, at local hustings events or when they knock on your door to ask for your vote. 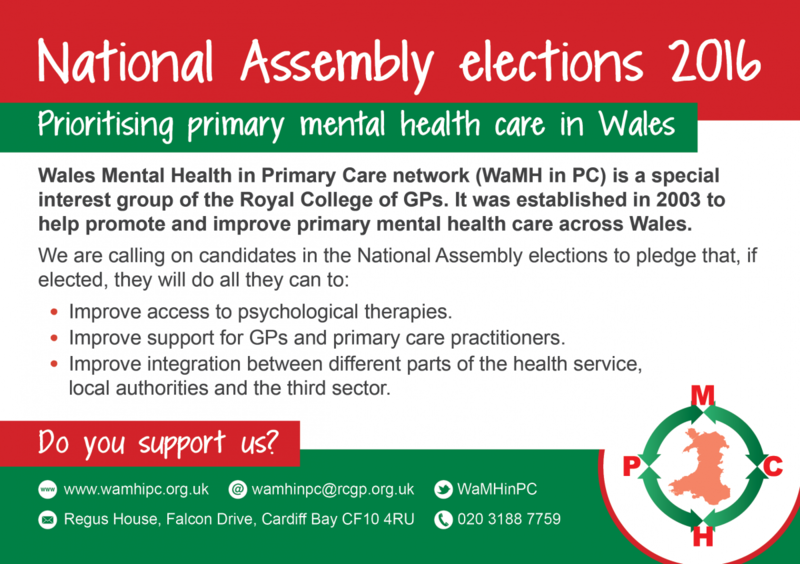 This will help us to increase awareness of the issues facing primary mental health professionals in Wales and influence the agenda once the new National Assembly for Wales starts to debate policy and legislation. Download a PDF of our election priorities here. Download images to share on social media here and here. 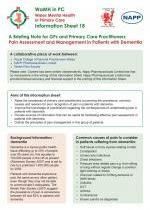 Our latest information sheet is a briefing note for GPs and primary care practitioners about pain assessment and management in patients with dementia. Raise the awareness of primary care practitioners concerning the prevalence, common causes and reasons for poor recognition of pain in patients with dementia. Improve the knowledge of practitioners regarding the consequences of undertreating pain in patients with dementia. Provide sources of information that can be useful for facilitating effective pain assessment in patients with dementia. Outline the principles of pain management in this group of patients. Each of our sheets have been developed to provide valuable information, training and support tools on primary care mental health in Wales. Their publication comes under the set objectives of our Gold Standard Project which has set the goafl of providing good communication on mental health issues. We have a range of other information sheets which are all available to view and download from our Information Sheets page. 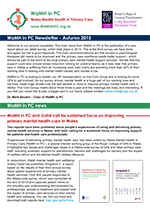 Welcome to the latest edition of the WaMH in PC (Wales Mental Health in Primary Care) newsletter. We hope this new initiative will keep you informed about what we are doing as a network as well as work going on around Wales - including key changes to policy and primary care mental health.